Emo hairstyles are similar to the hairstyles of music artists in the 1980s and the punk hairstyles in the past decade. Commonly, emo hairstyles include straight black hair with long bangs or fringes styled to one side, covering part of the face and eyes. However, the emo hairstyle is not limited to this anymore; styles have evolved so that anybody who wants to have an emo hairstyle can get one. The shape of your face is important when choosing a specific emo hairstyle. For people who have longer faces, a longer emo haircut would fit. For those with rounder faces, long fringes and short hair at the back would look best. Now that you know what kind of emo hairstyle would look good with the face of your shape, the next thing to do is find a picture with the kind of emo hair you want. There are numerous sources of emo hairstyles from the Internet, especially musicians. Bring this along when you go to your hairdresser, and have your stylist cut your hair the same way. Before you can get an emo haircut, you need to grow your hair a little first. This allows your stylist to cut in the emo style into your hair. Ask your stylist to cut the sides and the back of your hair in layers. The bangs should be made choppy. Although emo bangs usually have one side longer than the other, some emo styles can also have bangs cut straight across, covering the forehead. The hair at the crown should also be cut short, keeping it spiky with hair products. Have your entire hair dyed black or dark brown. If you want to add highlights, you can do so in a variety of colors. Emo hairstyles tend to use unusual hues in order to create a glaring contrast to the black hair – white, blue and even bright pink, for the more outrageous, are typically used. Highlights are usually added under the bangs and at the nape. Having emo hair is high maintenance. Styling emo hair typically involves the use of a lot of hair products. You can choose to either straighten your hair with a hair iron or create a messy, unruly look. For those with curly hair, try straightening even just the front part of your hair. When ironing your hair, remember to do so in small sections so that you go through all the parts. If you are a guy, you can also spike up the back of your hair, while keeping the front pat down. You can also use funky accessories and clips to style your hair. Getting an emo haircut is an important part of living the emo lifestyle. Although these are simple guides on how to get a basic emo haircut, it is important to incorporate your personal ideas to create your own one-of-a-kind emo hairstyle. Try it! Got this tru email. 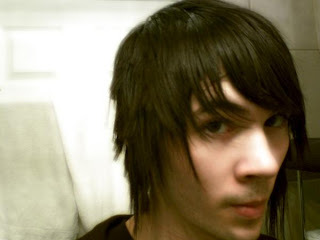 Another hot emoboy with a really nice emo hair. His name is Charles Brindle. Visit his myspace profile and be inspired.. He also cut his own hair and do the same for his friends.. talented.. Right now I'm running a small business and trying to make my way through college. Life for me is usually crazy but I've been living in a mad world so long I find it more enjoyable then a boring life. Better to live your life as an adventure then not live it at all. I also really like to help people out however I can. I personally think that the greatest way to spend your time is to be spending it helping others. If you feel like you ever need someone to talk to, send me a message and I'll do my best to get back to you. The time I spend here is not to judge people, just here to help them out as best as I can.